1) Anthony Alayon: Before we get started, can you tell us what makes the Arnold the biggest or the best event of all? Ben Tatar: What makes the Arnold greater than the other events in America or internationally is that the Arnold has the most competitions. It also brings in the highest quality superstars. The Columbus Arnold event has more athletic events than the summer and winter Olympics combined. Athletes from over 80 different countries come to Columbus to compete during Arnold weekend. 2) Anthony Alayon: How was the 2015 Arnold different from other Arnold’s? 1) THE WWE EXPERIENCE- The 2015 Arnold added a new event called The “WWE Experience.” When fans enter the expo, they immediately see a WWE/NXT ring. There are matches going on throughout Saturday and Sunday. After each match, the superstars sign autographs and take pictures with fans. The WWE Experience also offers try outs for fans who believe they have what it takes to be a WWE star. 2) THE ARNOLD KIDS’ EXPO- The Arnold added a kids’ expo targeted for kids between the ages of 6-16 or anyone who is really young at heart. The kids’ fitness expo has baseball, chess, fencing, football, golf, gymnastics, soccer, hockey and more. The kids’ expo also had events such as Arnold’s Quest for talent. Kids get to try numerous sports. At the booths, there are people dressed in costumes to keep things interesting. In addition, the kids’ expo has celebrities including: The band, N’Sync, Columbus Clippers, Columbus Blue Jackets, Cyclone gymnastics team, OSU cheerleaders, United States tennis association, Ohio State Football players and many more. 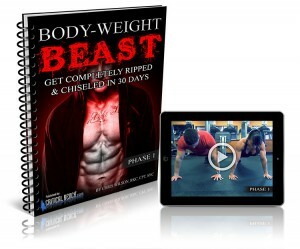 3) AMERICA’S NEXT GREAT TRAINER- The Arnold added a competition for personal trainers around the world. Trainers competed in a competition that tested their interviewing skills, appearance, fitness skills, knowledge and their ability to inspire. 4) MAS WRESTLING- Another new Arnold Event was MAS WRESTLING. This involves two competitors holding a stick in each hand. The objective is to take the stick out or drag the opponent over a wooden divider. Participants of all weight classes competed including smaller ladies and women who looked to be well over 350lbs. 5) DISC GOLF- Disc Golf is a new event which resembles regular golf, except it is played with a Frisbee. It looks similar to 18 hole regular golf, but the objective is to throw the Frisbee into a basket on a golf flag. It usually takes a competitor three to eight tries to get the disk into the basket. 6) MODEL SEARCH- This year the Arnold event had their first ever official model search competition. 7) PICKLEBALL- Pickleball is similar to tennis, but it is played on a smaller court. A pickleball court is the size of a badminton court. The paddles are made of composite materials including aluminum and graphite. The ball has holes like a wiffle ball and travels 1/3 the speed of a tennis ball. This allows the game to have lots of long volleys. This game appeals to seniors as well younger folks. At a more advanced level, the game requires lots of kill shots, spins and ball placement strategies. 8) POWER X- The POWER X competition is a contest where athletes perform the powerclean, bench press and deadlift for up to twenty repetitions in three minutes. Scores are calculated by multiplying the weights achieved with the reps on the bar. Most of the strength competitions have been about the fast twitch fibers and now the Arnold is targeting fitness strength warriors. 9) EQUESTRIAN- The Equestrian Western Horse Show made its debut at the Arnold. 10) MORE VENUE LOCATIONS THAN EVER- The Arnold also added a new venue called the “Ohio Expo Center.” They added events here such as archery, cheerleading, dance, crossfit, disc golf, equestrian, pickleball, POWER X, table tennis and XPC Powerlifting. The Arnold Expo was also different due to having more NFL players, UFC Fighters and WWE wrestlers than ever before. The Expo was loaded with booth babes, pro bodybuilders and top notch strength athletes, like every year. 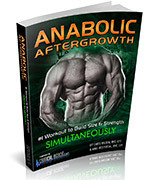 3) Anthony Alayon: How do today’s bodybuilder’s physiques differ from how they were ten years ago? Ben Tatar: When I was going ten years ago, it wasn’t even called, “The Arnold Sports Festival.” That is how much the event has changed. However, there were always monsters, and that hasn’t changed too much. 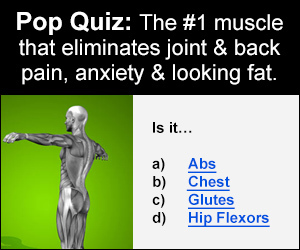 What has changed is that the event has become more mainstream with different types of fitness athletes everywhere. For example, ten years ago it was hard to see a UFC fighter. You would have Daniel Bobish at a booth. 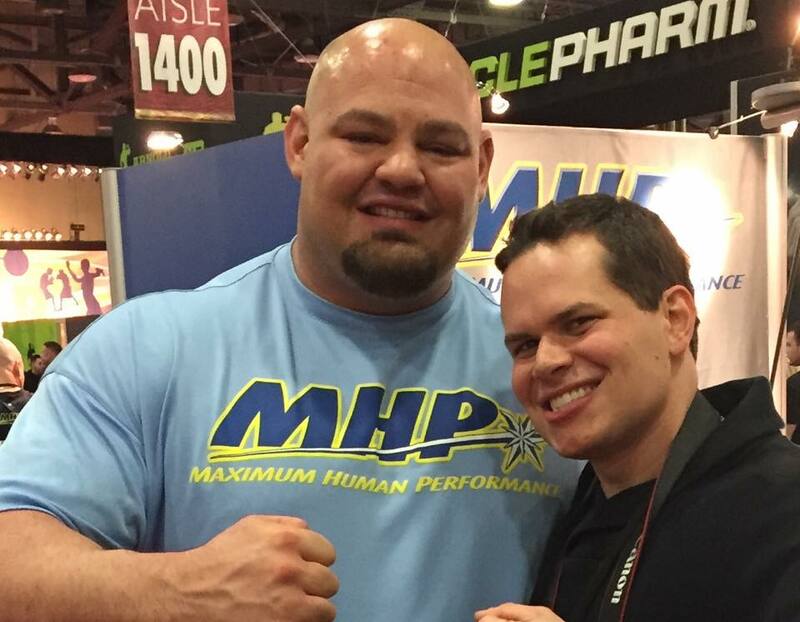 Today it’s just as common to see UFC fighters at the booths as it is to see 300+ pound bodybuilders. Also, today there are more 6’1 200lbs male fitness models going as sponsored athletes or NFL players, and maybe ten years ago you would see more 6’4 400lbs powerlifters at the booths. I think they have as many UFC fighters and pro athletes at the booths now as bodybuilding pros. That’s one of the changes of the times. WWE is now on the main stage. When I first started going, table tennis was on the main stage. That really shows how much the event has changed. 4) Anthony Alayon: Tell us about the Arnold night life? Ben Tatar: One of the events that I like attending on Friday nights is the “Make it fit” charity event for Autism. The event raises money and autism awareness. 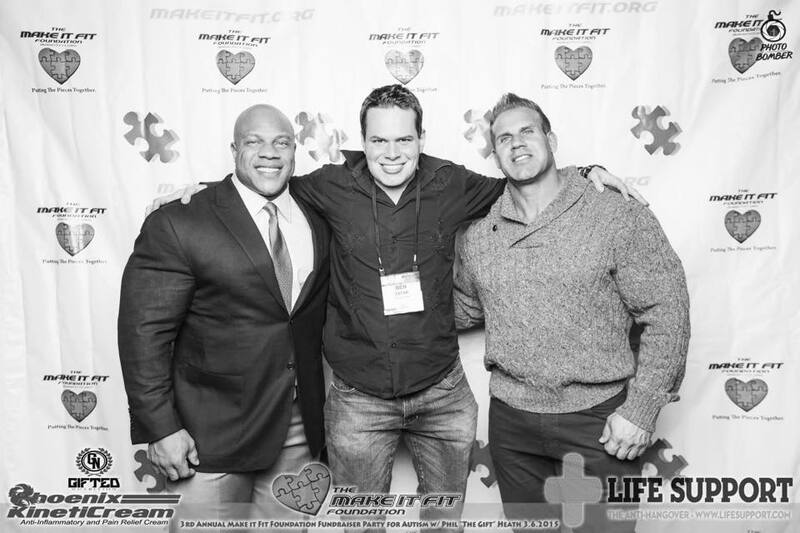 Phil Heath and Jay Cutler took pictures with fans at the photobomber. The Ohio State National Champion Buckeye team was also there. 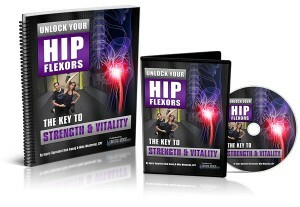 A lot of the big and warm hearted individuals from the fitness industry attend this event. At night there is also the Arnold After Party at the Hollywood casino, where people attend and celebrate Arnold weekend! The sponsors of the party hire individuals who are dressed in mascot like outfits to give the party a larger than life feel. The other event some people attend is the Mega Bash party at Bluestone. At this event, there are lots of costumes and celebrities from the booths. There is also downtown Columbus where people are celebrating all over throughout Arnold weekend. On Thursday Night, they had a firemen versus policemen boxing event and the “Meet the Pros,” event. 5) Anthony Alayon: What were the adversities during Arnold weekend this year? Ben Tatar: On Friday there were lots of flight cancelations and delays due to snow storms. I heard that on Thursday over 4000 flights were canceled or delayed because of the weather. When I went to the expo on Friday, many of the celebrities who were suppose to be there weren’t there. 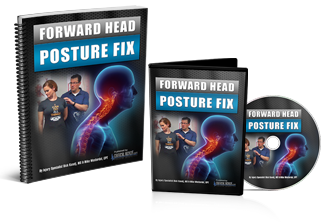 The companies told me they were frustrated because it affected their business. 6) Anthony Alayon: What was your favorite event from the entire weekend? Ben Tatar: I liked the World’s Strongest Man competition the best. I’m good friends with Brian Shaw and I liked cheering him on. I also liked how the Arnold Strongman Event is based on maxing out with unique events. The World’s Strongest Man contest at the Arnold is the most popular. 7) Anthony Alayon: What did you learn from attending the Arnold this year? Ben Tatar: I have done these events for a long time, so I know where to position myself. 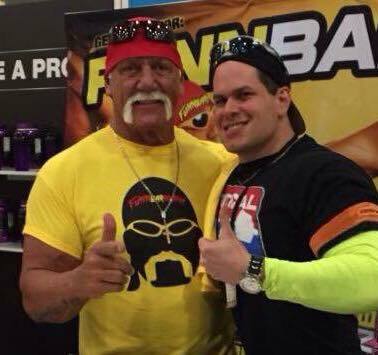 For example, I saw Jon Bones Jones and Hulk Hogan out of the expo without anyone around. One thing I have learned is to not walk in the center of the Expo on Saturday when it is crowded. It helps to memorize where everything is on Friday, then walk the front or back of the aisles. This got me to where I needed to go on Saturday quickly without worrying about crowd traffic jams. 8) Anthony Alayon: What are some of the things you see on the Expo Floor? Who Has The Best Supplement Booth & What Makes Their Booth Different? Ben Tatar: For the Expo Floor you see over 900 booths. At every booth you have models, bodybuilding freaks, pro athletes, big celebrities, UFC Fighters, WWE wrestlers, NFL players, new exercise attractions, little fun exercise challenges and lots of friends who work in the fitness industry. There are lots of great photo opportunities at every booth and people to meet who are into what you are into. The EAS booth this year was really interesting in that they had events such as soccer kicks where fans would get points for kicking the ball into holes. 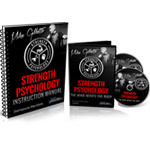 Other events such as the MHP booth or Animal Cage have the strongest lifters in the world. Every booth had something unique to offer whether it is top notch models, the best pro athletes in the world, freaks or friends. 9) Anthony Alayon: You are very strong yourself. Tell us about some of your best lifts? 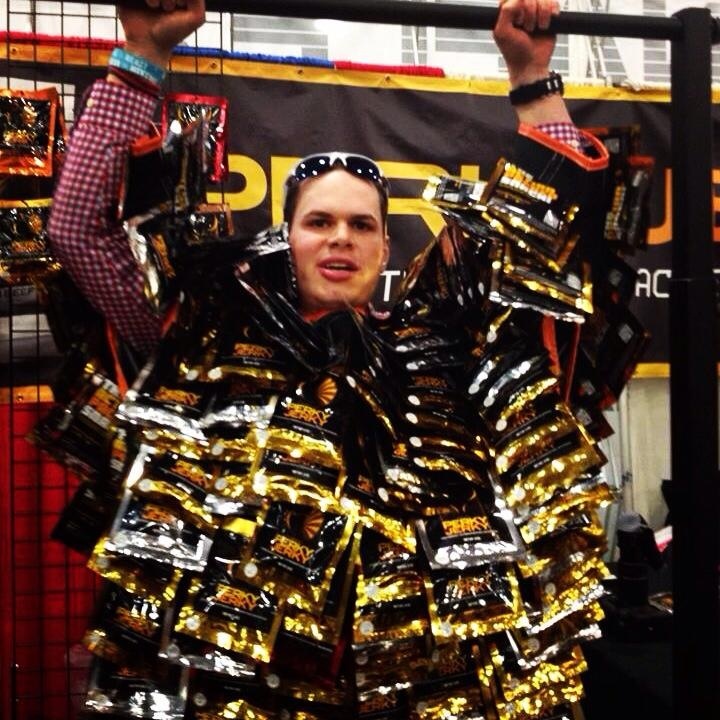 Ben Tatar: Last year I set a record at the Arnold for doing 40 pull ups with a 50 lbs perky jerky vest. I also have locked out 810lbs on the bench press, the most ever for my height and weight. There is a biography on this in my Iron Man Magazine Biography. I have close grip bench 315lbs with 100lbs band tension which made the weight 415lbs at the top for 10. I did reverse band bench press with 2 blues for 600×15 easy and 500×30. On incline bench I could rep 405 from the eye level for 10 and on the incline hammer strength machine I could do 405 for 35 or 500 for easy high reps. (That’s as high as it would go). 10) Anthony Alayon: You’re a freak! What was it like hanging with some of the big name celebrities this year? What about the freaks and models? Ben Tatar: I actually got to spend lots of time with Jon Bones Jones and Hulk Hogan without people around. Jon Bones Jones and I always end up fooling around, and we get silly. 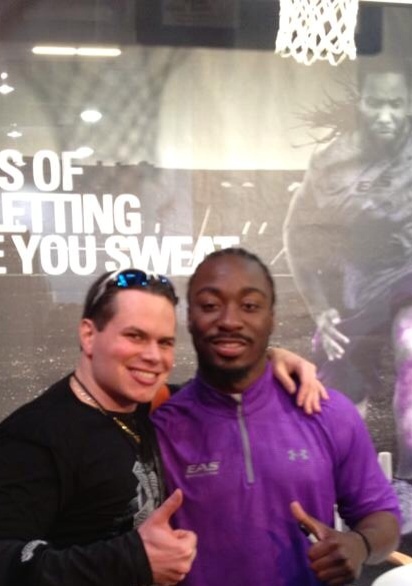 He took a picture with me at the Arnold, as he playfully kicked me in the head! Hulk Hogan is also another goofball who is a lot of fun. The World Record Holder, Tiny Meeker is very entertaining and playful! Former Mr. Olympia, Jay Cutler was very laid back. At the Makeitfit party, he was very introverted unless people were taking pictures with him. 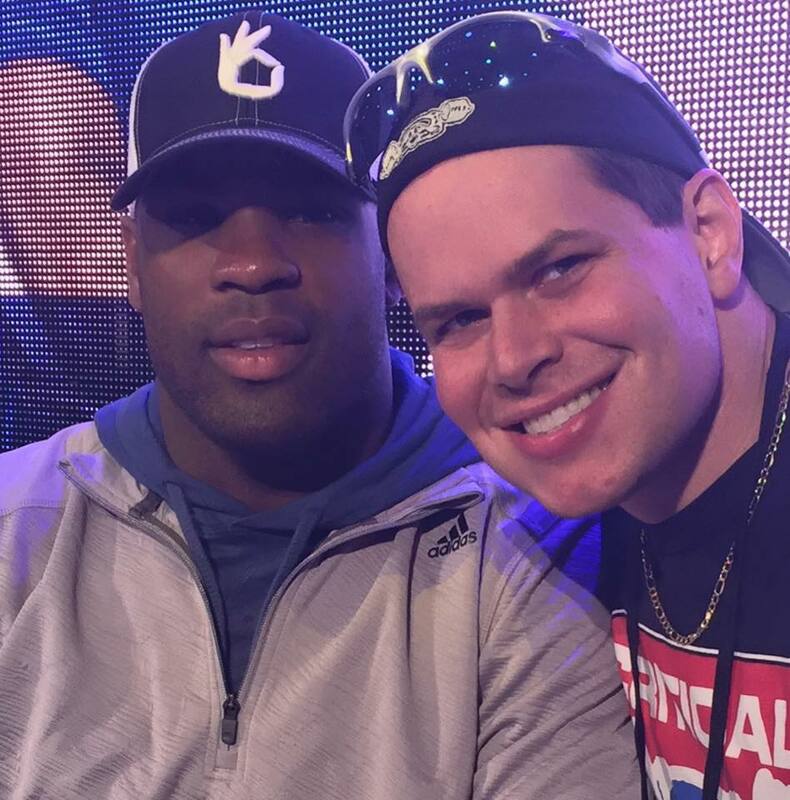 DeMarco Murray was nice, and all the NFL players are analytical and charming. The booth babes and I always play, as they would do pull ups on my arm, or I would pick them up a lot. We all just have tons of fun and if we aren’t playing, they all have a story that they would like to share for media. With old friends like Micah who is a WBFF champion, it’s always easy because we go way back. I always enjoy meeting former New England Patriot player Marc Megna because he is inspiring. Every interaction was positive. You build bonds, and it creates excitement for the next one. 11) Anthony Alayon: Do you have any advice for people attending the Arnold? Ben Tatar: I would say definitely check the Arnold out. It’s the best event in the world in that it has the most events and the highest quality sport stars of all expos. You will bring back memories that are forever. 12) Anthony Alayon: In Closing is there anything else you would like to say? Ben Tatar: I will see you all next year. 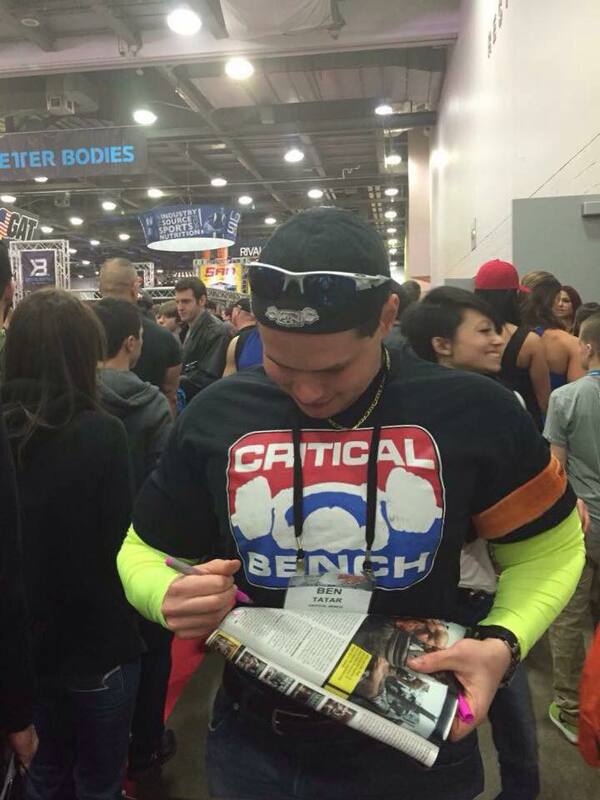 I want to thank Critical Bench and the Arnold for allowing me to cover the event. I’m already looking forward to Arnold 2016! 1) Anthony Alayon: How is the Arnold different from the Olympia? Ben Tatar: The Arnold has more of everything. 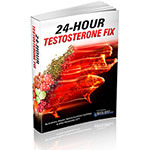 It has more athletic events, top athletes, supplement booths, celebrities and fans. There is nothing else like it. The Arnold has more competitors than the Olympics. You can’t get an experience like the Arnold anywhere else. 2) Anthony Alayon: How many people attend the Arnold? Ben Tatar: Over 175,000 people attend the Arnold Sports Festival as 40,000 attend the Olympia weekend. 3) Anthony Alayon: How was this year’s Arnold different from other Arnold’s? Ben Tatar: There were more events. The Arnold added swimming and tennis. There are people from over 80 different countries who compete in the Arnold. For me, this year was different because I got to compete in the Arnold table tennis competition against the best in the world. 4) Anthony Alayon: How was the 2014 Arnold bigger than the Olympics? Ben Tatar: The Arnold Sports Festival has over 50 events where as the 2014 Olympic games only had 15 events. The 2012 Summer Olympics in London had 40 events, where as the Arnold has over fifty events. 5) Anthony Alayon: That’s interesting: What celebrities did you see at the Arnold? Ben Tatar: I saw Arnold Schwarzenegger, Jason Statham (famous action movie stars.) 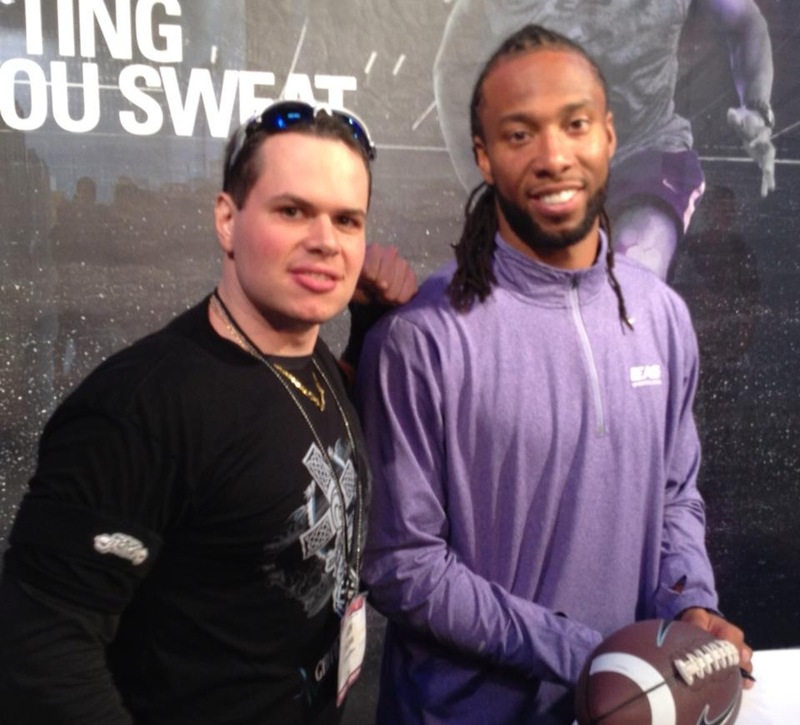 Larry Fitzgerald (one of the best NFL receivers,) and Marcus Lattimore from the 49ers. Many other NFL stars were there, such as MVP running back Jamal Lewis and the great Lynn Swan from the 70s Steelers. UFC champions, Jon Bones Jones, Chris Weidman and Cain Velesquez were all there. All the Mr. Olympia and Arnold champions, including Jay Cutler, Phil Heath, Ronnie Coleman, Branch Warren, Dennis Wolf and the rest of the pros were there. Some of my old heroes like Mark, “The Hammer” Coleman and Don Frye were in attendance. 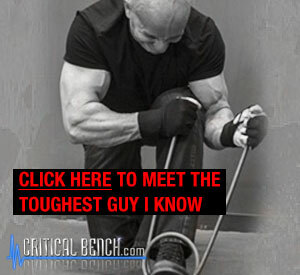 The bench press champions, Tiny Meeker and other world record holders in powerlifting, along with the World’s strongest man competitors were competing or working. I also saw Buster Douglas who beat Mike Tyson. Other UFC fighters included Ryan Bader, Frankie Edgar “The Dragon,” Lyoto Machida, Bobby Lashley and many WWE wrestlers were there. I got to see all of them. 6) Anthony Alayon: How was the Arnold night life? Ben Tatar: The Arnold night life was really good. My good friend, Alexis Young won the Rockstar Bikini Contest on Thursday Night. On Friday Night, I went to the “Make It Fit” event which was a great fundraiser for Autism. 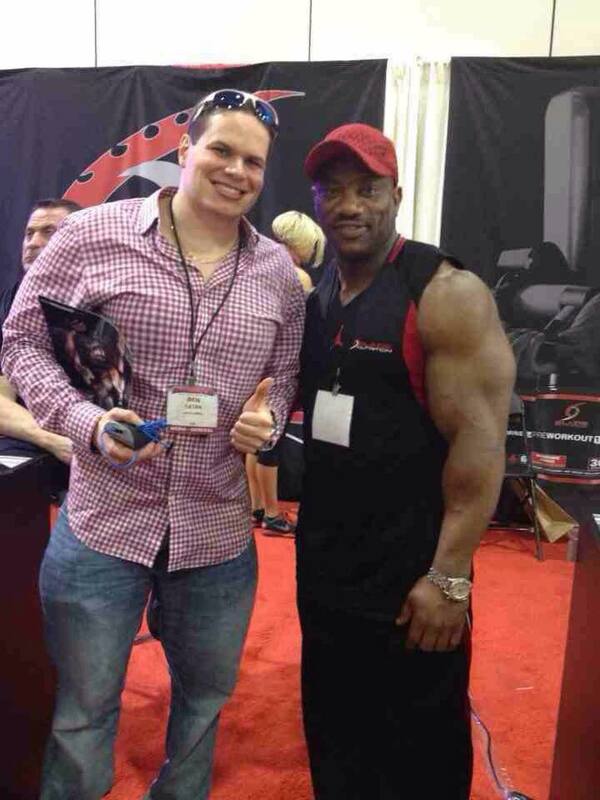 Phil Heath and Jay Cutler were there. The 1000+ pound squatter, Ed Russ, his pro strongman brother Mathew and many great spirited people made it a fun event. Saturday Night, I went to the Mega Party event. Every single celebrity was at the Mega Party and there weren’t a lot of fans there since it was for workers/celebrities. It was great getting to party with everyone. 7) Anthony Alayon: Who gets the freak award? Ben Tatar: For size, it’s Ed Russ. Anytime anyone sees him, he is instantly remembered forever.(laughs). 8) Anthony Alayon: What was the biggest surprise at this year’s Arnold? Ben Tatar: The biggest surprise was running into Oxygen Magazine Cover Model, Natalie Hunt at the MegaParty. 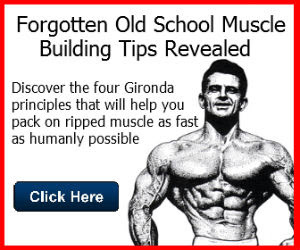 I haven’t seen her in over five years and I presumed she was done with the fitness industry. Then for entertainment, she put me in the sharpshooter (a WWE wrestling submission move by Bret Hart,) like she did at the 2008 Arnold which can be read here: http://www.criticalbench.com/2008-Arnold-Expo-Report.htm Wow- times goes by fast! 9) Anthony Alayon: Tell us about the record you set at the Arnold! Ben Tatar: There was a contest to see who could do the most pull-ups with a 50lbs perky jerky vest. Of the hundreds and thousands of people who tried, I set the record as I did 40. I set the pullup record at the Olympia in Vegas before, but this one was better since I did 40 pullups with a 50lbs perky jerky vest. 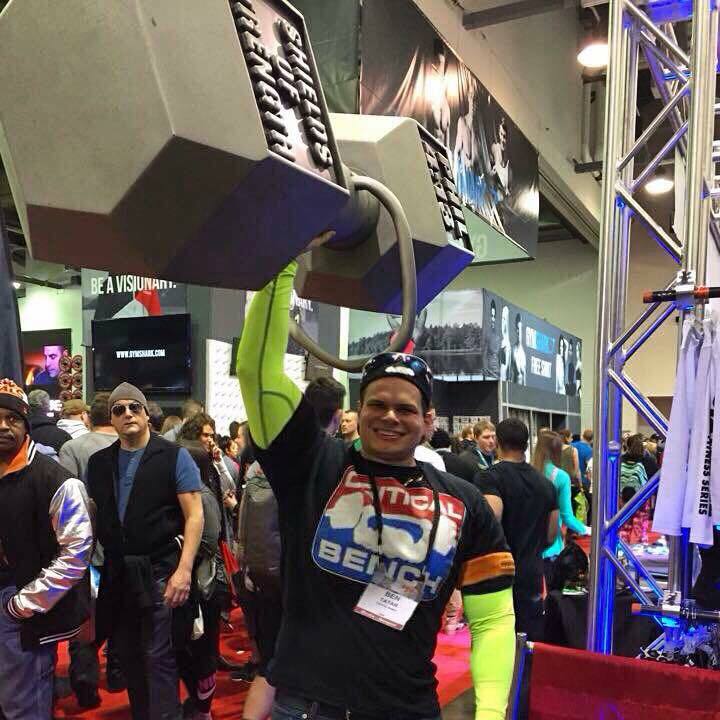 10) Anthony Alayon: Who inspired you the most at the Arnold? What was the best advice you got? Ben Tatar: I’m not sure because I’m not looking for advice like I use to. It’s mostly about insightful conversations, love and entertainment. However, I want to thank the GLC2000 booth for being really good to me. I also am inspired by Mark Coleman because he is such a great human being. He’s not just loved by people who don’t know him, he is also really valued by people who have known him forever. 11) Anthony Alayon: What are some of the exciting attractions in the expo and around the convention? Ben Tatar: When you leave the expo, you walk around halls and in each hall is a huge room with a different exciting competitions. Then when you go in the Expo, the booths feature different celebrities or activities that attendees can try. The MHP booth is always fun and so is the animal cage since the best lifters in the world are always doing feats of strength. Then you have the main stage where the “World’s Strongest Man competition,” or another big competition is going on. There is really so much going on everywhere and it’s amazing how many people you run into who you haven’t seen in years. For example, I ran into Steve “KONO” Konopka unexpectedly. I’m running into fans who I don’t know and people I have interviewed who I haven’t met. There are lots of exciting stuff going on all the time. 12) Anthony Alayon: Sounds like a total blast. In closing is there anything else you would like to say? Ben Tatar: Special thanks to Critical Bench for the press pass. Special thanks to the GLC2000 booth for their VIP treatment. Anthony, thanks for the interview. I had a great time at the Arnold and it was a spectacular event. I really went hard, sacrificing meals and sleep! It was a true rush from start to finish!